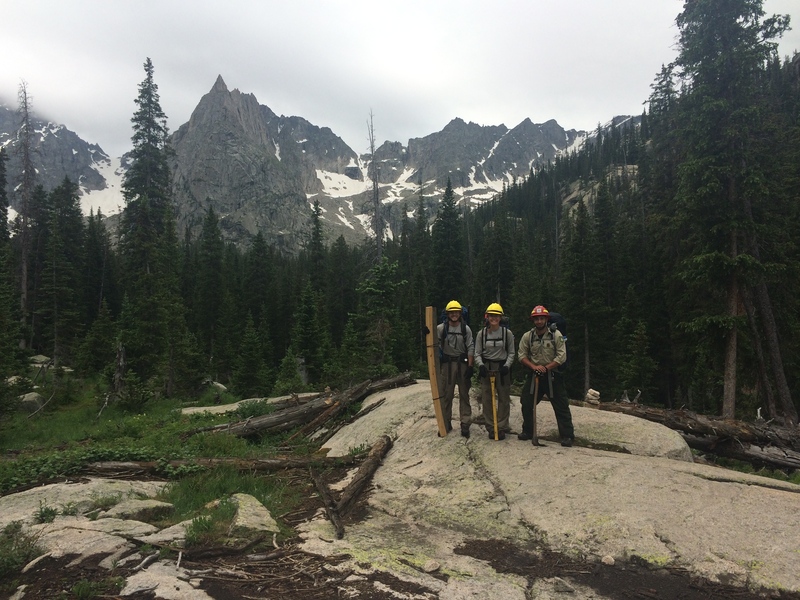 This past summer I was lucky enough to spend four days in the backcountry doing 4th of July patrols in the Never Summers Wilderness with two other crew members. We were able to see three beautiful lakes. My favorite part of the patrol was scattering campfire scars and destroying illegal campsites. It was a different kind of service that felt incredibly rewarding. The physical aspect of this trip was also some of the most difficult backpacking I have ever done and at the end of every work day, dinner never tasted so good and felt so well deserving! This has easily been my favorite memory of the summer. Alongside with my favorite memory, I have another awesome experience that includes my favorite work project. 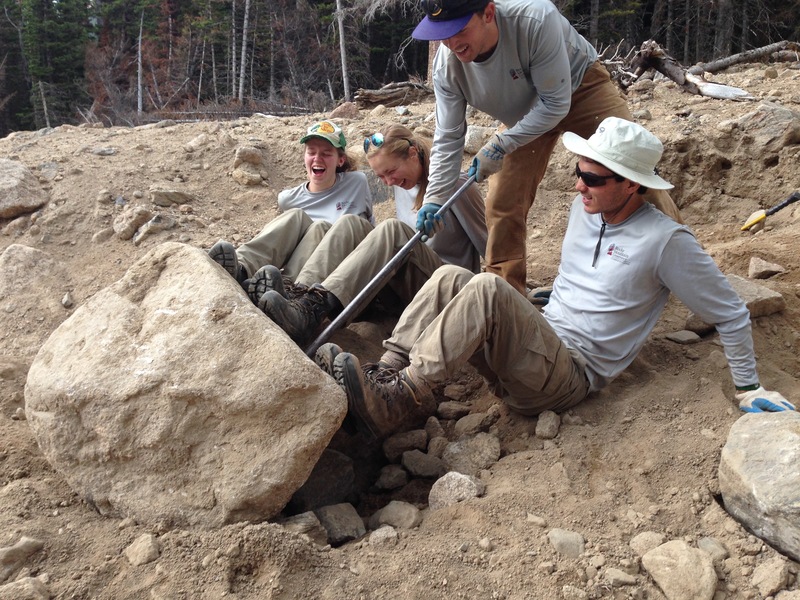 This was being a part of clearing the knight ridge trail that is a 3 mile section of the CDT. It was the most amazing feeling seeing two through hikers pass by and give us the biggest thank yous for allowing them to stay on trail. This is a photo of me trudging through the tundra atop Mt. Ida, on a weekend hike we took in the park. 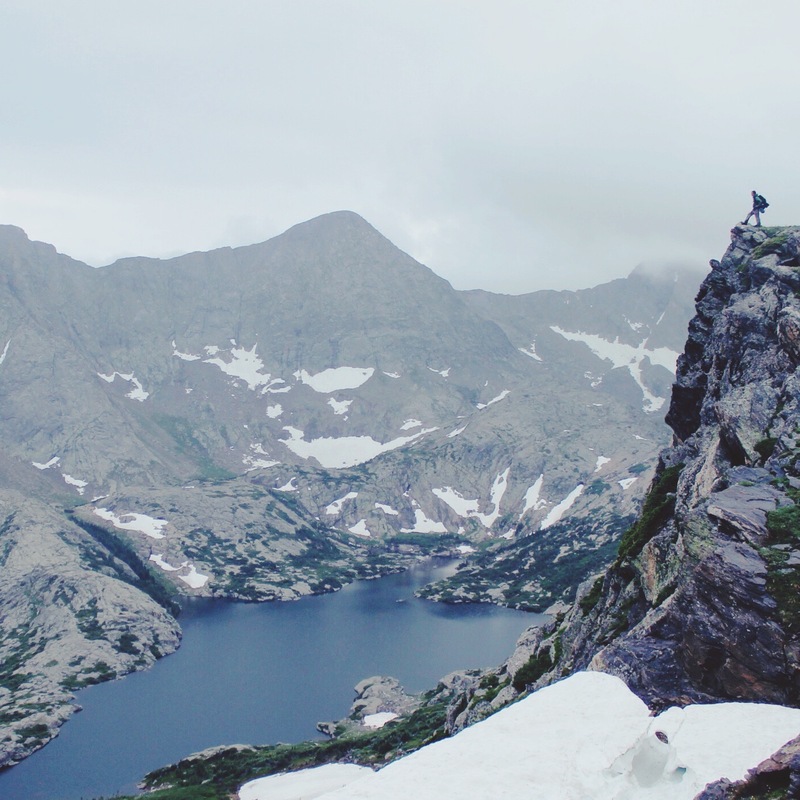 In the background are the Never Summers, which are part of the Sulphur Ranger District of the Arapaho-Roosevelt National Forest. I like this photo because it shows what a vast and beautiful area we got to work around this summer, and how small we are in comparison. 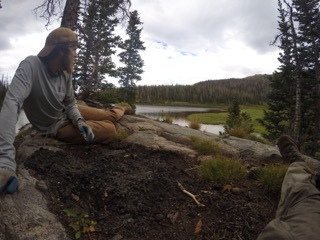 One of my favorite memories from this summer is each time we had to hang our food during our backcountry hitches. With anywhere from 3 to 15 people in our camp, It was a difficult task to find trees capable of holding all of our food without sagging. We always had a laugh trying to untangle miles of paracord and make sure our food was “safe”. 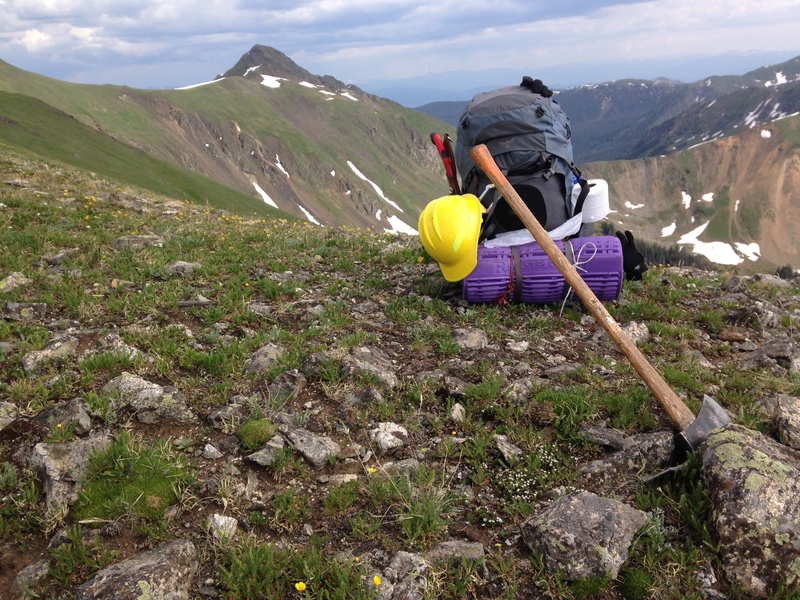 My favorite work project of the summer was our last hitch, on the Devil’s Thumb trail in the western Indian Peaks Wilderness. 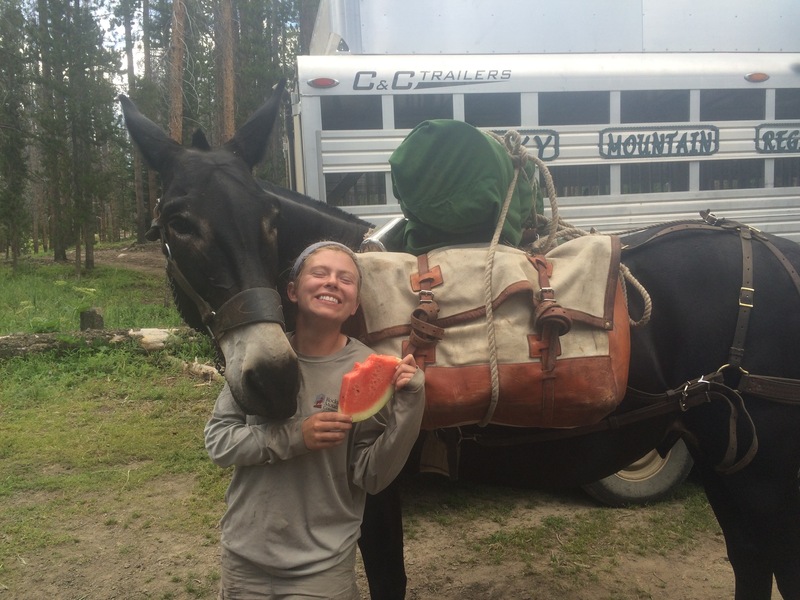 Working with another conservation corps (the RMYC) as well as a packstring of mules was a really unique experience that I will not soon forget! We did a lot of really valuable work on the trail that will hopefully hold up for many years to come. 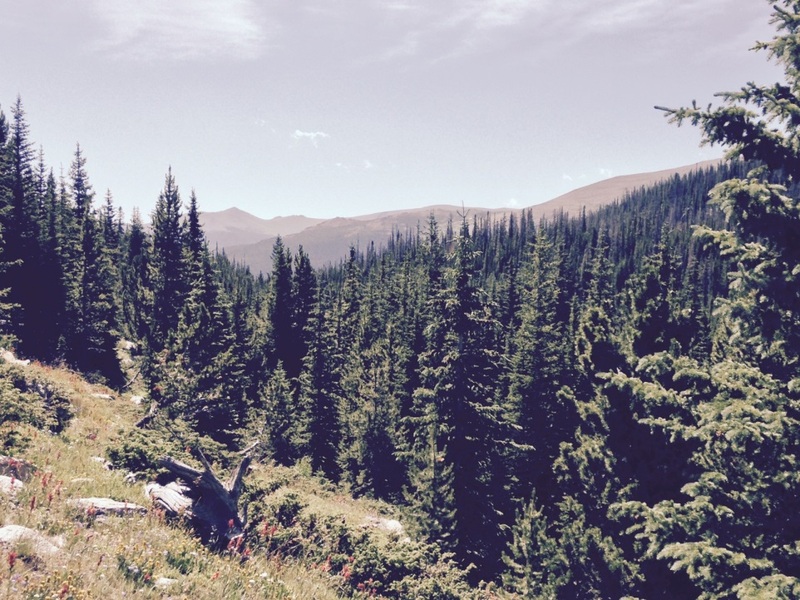 Also, it was definitely one of the most beautiful work sites we were in, given its location on the continental divide. 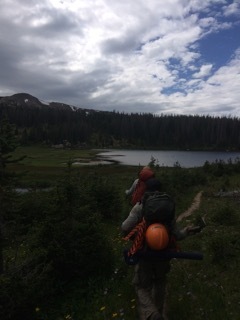 The memory of this season that I hold in highest regard is when the wilderness trail crew accompanied on a steep couloir climb after a longs days work on Columbine Lake Trail. The climb was slick, vegetated, and very, very high off the valley floor; I was frightened nearly the entire way up. I remember being so extremely relieved and proud of myself upon reaching the top and seeing the lake. 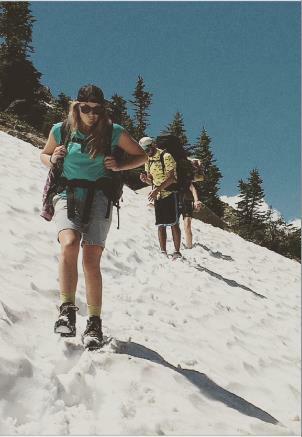 Nothing like a severe mountain pitch scramble to bring out your fear of heights. observe the world from a totally new perspective. the pass was to scramble straight down the rocky talus slope to camp. This is my favorite photo of the season simply because it captures how spectacular of a place we got to work in this summer. 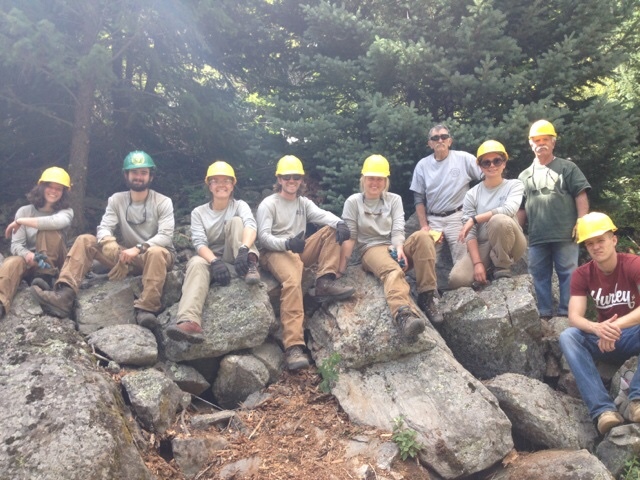 The photo was taken in the Indian Peaks near Crater Lake on our crews Fourth of July backcountry patrols, during which my team spent the week decommissioning illegal campsites and conducting general trail maintenance in the area. My favorite memory of the season actually happened the night before this photo was taken. 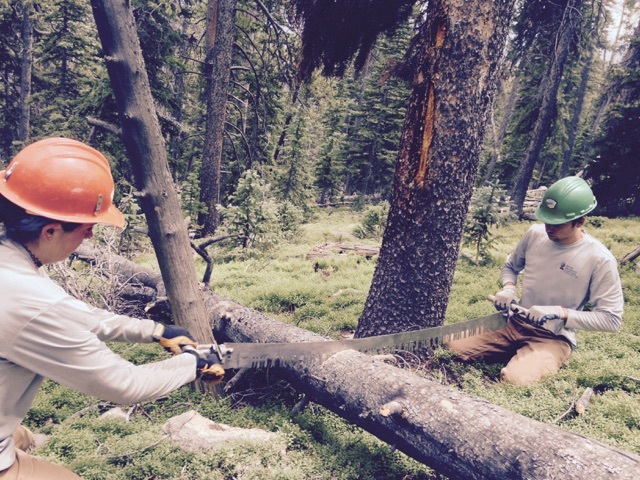 We spent the day clearing a massive tree off of the Pawnee Pass trail a few miles from Crater Lake. The weather was beautiful all day and there wasn’t a drop of rain- that is until our hike back to camp. It started to rain about a half mile from Crater Lake and it continued to rain harder and harder until it finally turned into marble size hail as we arrived at our campsite. We were drenched head to toe and took shelter from the hail for the next 20 minutes or so under some skimpy subalpine trees. Anyone else might have found themselves slightly miserable in such conditions, but we could help but to laugh and make the best of it. The sky finally cleared and left an inch of hail on the ground and a massive puddle under our tent, which was nothing a simple drain and hot dinner couldn’t fix. 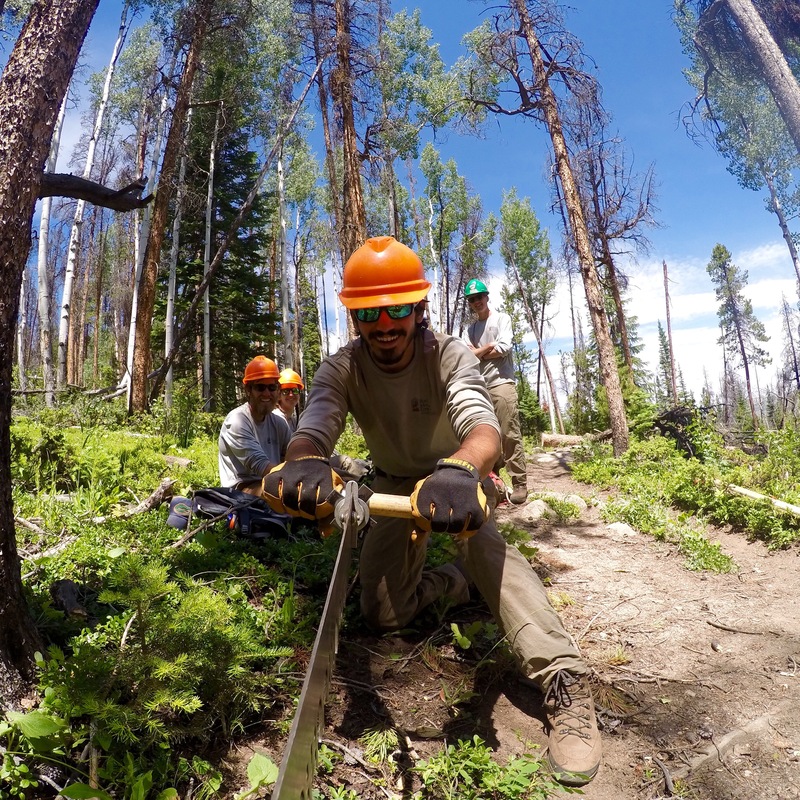 My favorite work project of the year was our final backcountry hitch near Devil’s Thumb to restore a severely eroded portion of the Continental Divide Trail. It was a particularly memorable project because we got to work above tree line for the entirety of the trip with amazing views of the Fraser Valley. 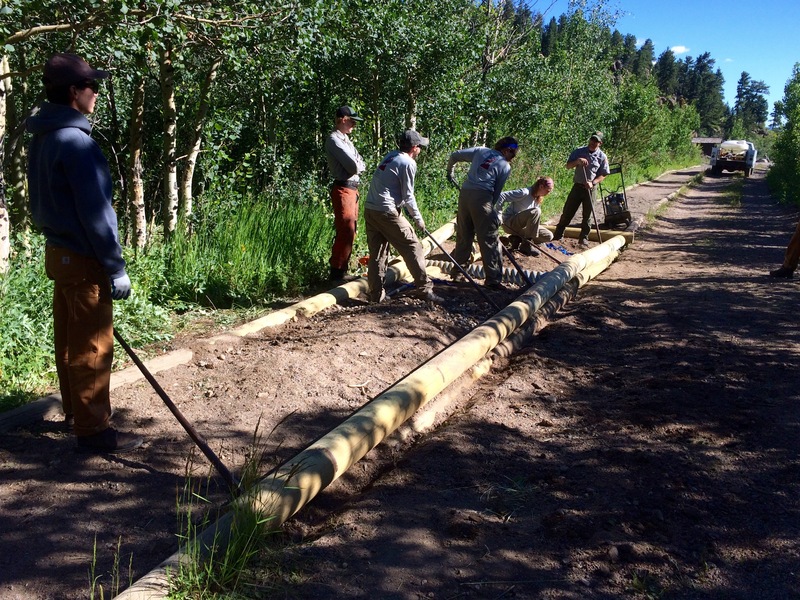 We also got to work with a specialty pack string of mules that helped us with much of the project’s heavy lifting. By the end of the week the trail showed incredible improvements and left us feeling extremely satisfied with the work we’d done and the skills we’d acquired throughout the season. (Pictured above is my home for basically all of this summer). 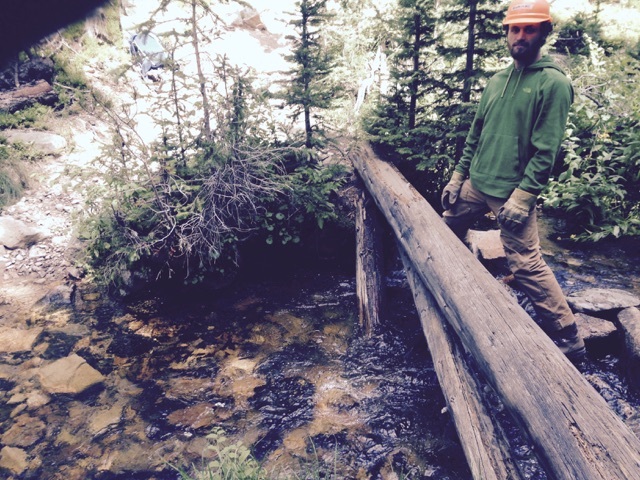 My favorite project this summer, by far, was our backcountry hitch to fix a bridge on the Buchanan Pass Trail. The 8 days we spent in the backcountry were hard and physical, but the outcome was so satisfying. 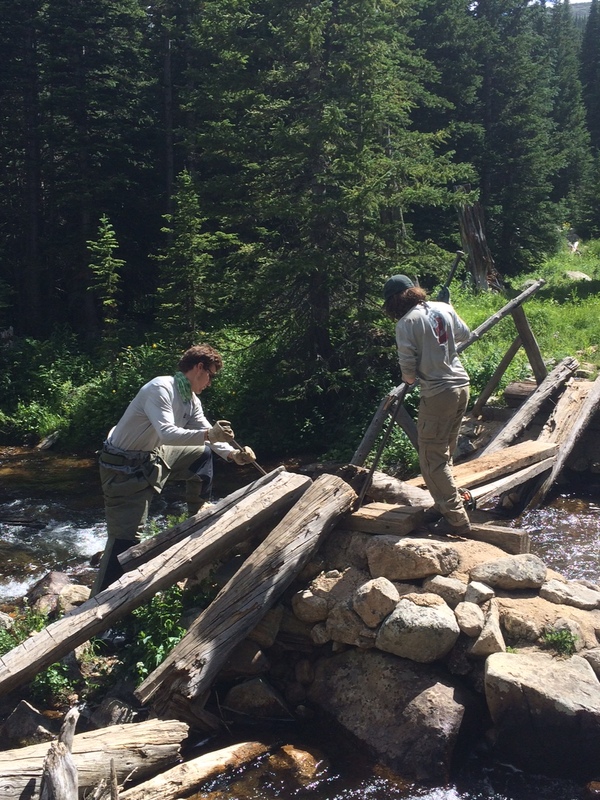 We knocked out our bridge in four days and got to spend the rest of our time exploring and improving the beautiful trails just south of Rocky Mountain National Park in the Indian Peaks Wilderness. Our crew really came together during these 8 days, and the hitch was filled with laughter, delicious camp food, and some seriously hard work. Our 8 day hitch was the best possible way to end our summer, and I cannot wait to come back and show people the bridge I built in the wilderness. My true highlight of the season was having access to such amazing public lands and seeing as much as I could of those lands with my crew. The crew was a highlight as well, and I couldn’t have hoped for a more friendly, as well as adventurous group to be around for the summer, and hopefully on adventures in the future. As far as projects, I was pleased with our boardwalk and turnpike near Buchanan pass which I was able to proudly show my parents and girlfriend. 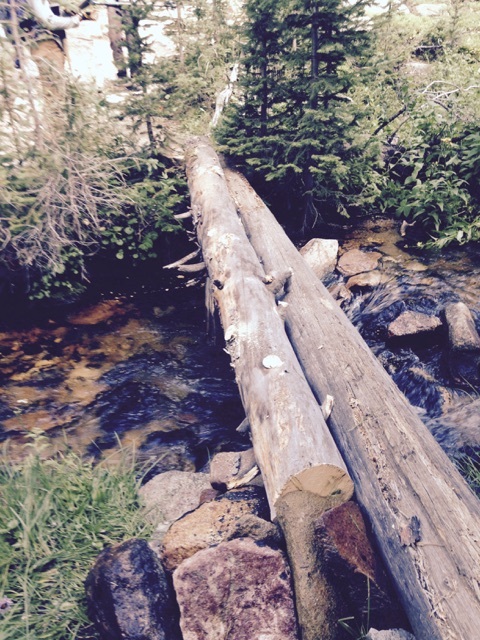 Favorite work project: We had an eight day backcountry hitch where we camped in the wilderness and built a bridge. The trails around us were beautiful. The project we the most rewarding and we got to see a few hikers use our work. We really got to appreciate the work that goes into such a simple structure because we weren’t allowed to used mechanized equipment to persevere the wilderness. Favorite Memory: We had just finished a day of work and we were at red deer lake, a beautiful lake in the mountains by glaciers. Almost everyone jumped in and some of the crew fished (and caught the first fish of the summer). It was super fun and a great way to end the day. This photo was taken at Backcountry Pizza the day we returned from our eight day backcountry hitch. The distorted picture shows us devouring the much anticipated meal. The eight day hitch was tough, but the end result of our hard work made it all worth it. One of my favorite memories was walking on the bridge that took us five days to build. The feeling of accomplishment was priceless. The bridge was definitely my favorite project. This summer has been full of great memories and projects that will be on my mind forever and also serve as tokens to exemplify the great life I am so privileged to experience! 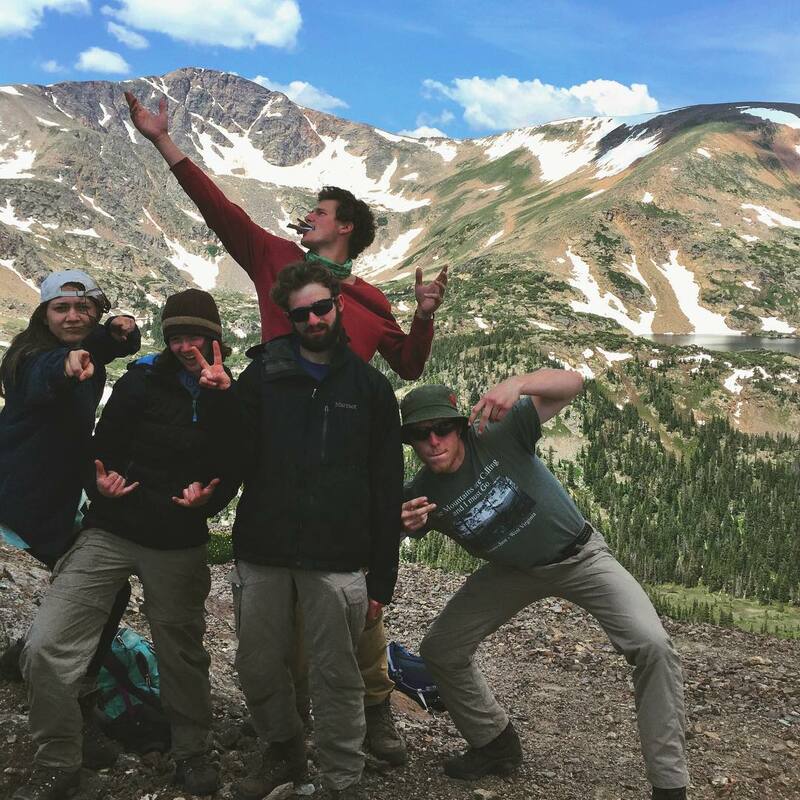 The Boulder crew has been very close the whole season, so the best memory I have with the crew has to be when we were together on the eight-day backcountry hitch, camping and completing an awesome project! 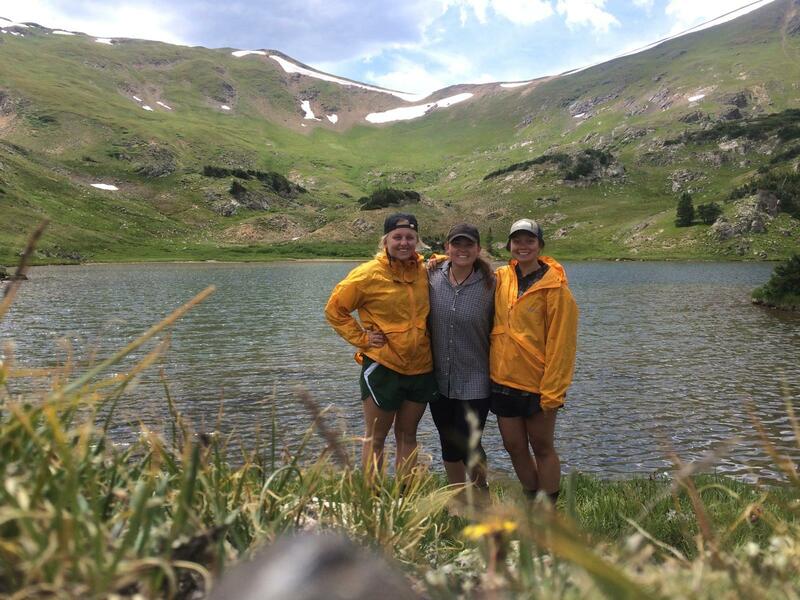 The photo submitted was shot on the last day of the hitch at the bottom of Elk Tooth Mountain, where we hiked with our Forest Service supervisors and now friends, Paul and Cait, to have a great, last hike together as a trail crew! The laughter of the group filled the air, and the realization that the summer was coming to an end was a little disheartening, but I’ve been told that the great moments often come to an end but always assimilate in your conscience as a great experience! The sturdy backcountry bridge, which we built in a rather quick three and a half days on the hitch, is also my favorite project because we used teamwork and the skills we have learned throughout the season to construct a long lasting structure that will aid adventurous hikers looking for a wilderness experience for many years to come. Our crew and myself are very proud of our work this summer, and I love the fact that this internship opportunity has improved my ability to work as a team and also my character! Top of James peak. This very accurately describes the dynamic of our crew. Favorite project: obviously our big projects, such as the bridge and Boardwalk, were fun to work on and we used as a template to show off our skills. However, sometimes the little projects are the most impactful. 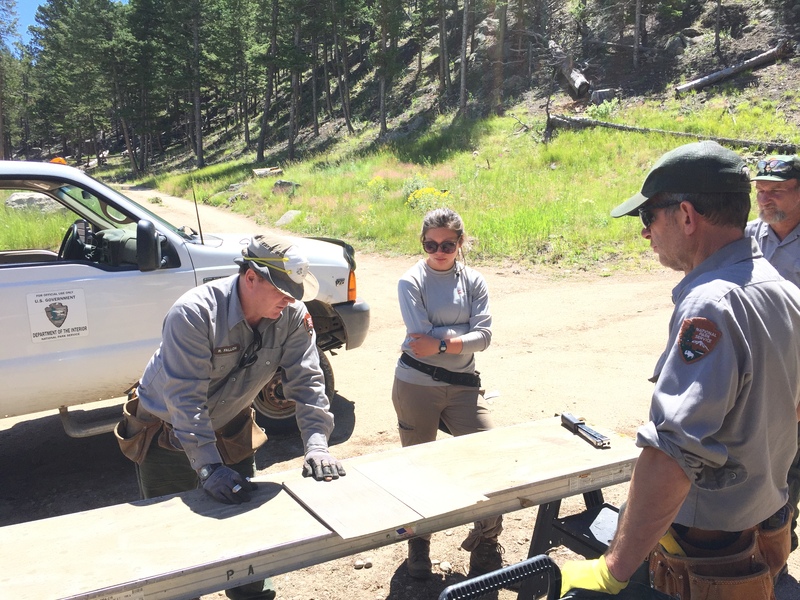 My absolute favorite project was a culvert that my USFS supervisor Cait and I worked to reset. It turned out to be incredibly difficult, taking two days to complete, but once it was done the sense of pride and accomplishment was completely worth it.. 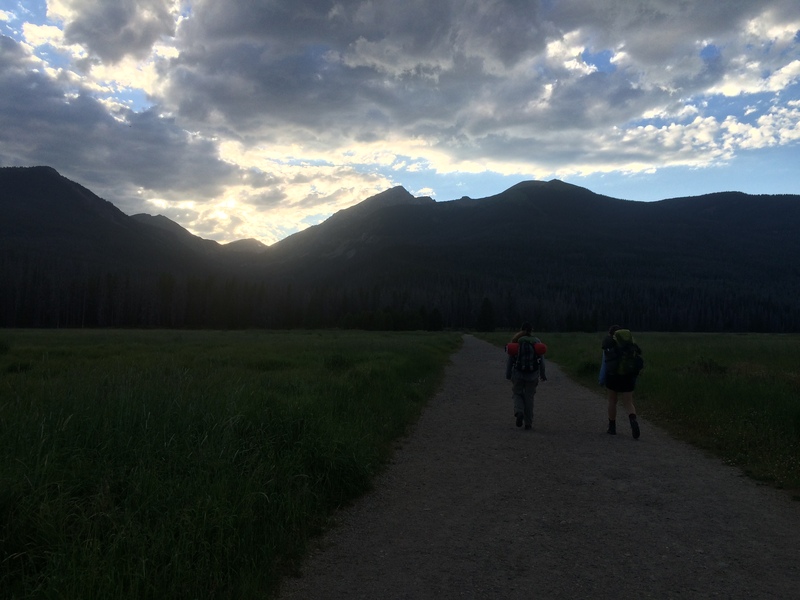 Favorite memory: at the end of the 8 day hitch, we were all exhausted, yet plowed our way through the 5 miles hike…with out stopping. When I arrived at our meeting spot, I was greeted by sweaty, smiling faces and the promise of pizza and wings. The car ride back was giddy and exhilarating, as we realized we just did an incredibly difficult hitch with ease. It made me realize how strong our crew was and how much we had grown as a team. My favorite work project by far this summer has been the Little Buckaroo Barn. It was a new experience for me, doing construction and carpentry on historical buildings, and also working in one place for an extended time. I loved seeing the changes in the valley over the last two months, and since the barn is nestled right in the middle of Kawuneeche valley at the base of the Never Summer Mountains, it was the perfect place to witness the sequence of wildflowers blooming in the meadow and the ebb and flow of the Colorado River. My favorite memory of the entire summer would have to be backpacking in the Never Summers with Jenna and Kris the weekend of the blue moon. It was Kris’ first backpacking experience, which was awesome to be a part of, and we had a spectacular camp site for watching the moon rise in a clear sky. We had been planning and dreaming of hiking into the bowl we could see everyday on our drive to work, and we finally made it into that gorgeous cirque. It was taken on my first backpacking trip, when Margaret, Jenna and I started at the Bowen-Baker Trailhead and hiked a few miles into the Never Summer Wilderness to camp, then hiked to Parika Lake the next day. It also happened to be the night of the Blue Moon, or the second full moon of the month. After I started a fire, we sat and watched the moon rise like the sun over the Kawuneeche Valley. It was absolutely gorgeous, and we slept under the stars and the moon to fully appreciate its beauty. This experience was a close second to my favorite memory of the summer. My favorite project would have to be the Little Buckaroo Barn. It was my favorite because, well, we were the work crew. Just the six of us. 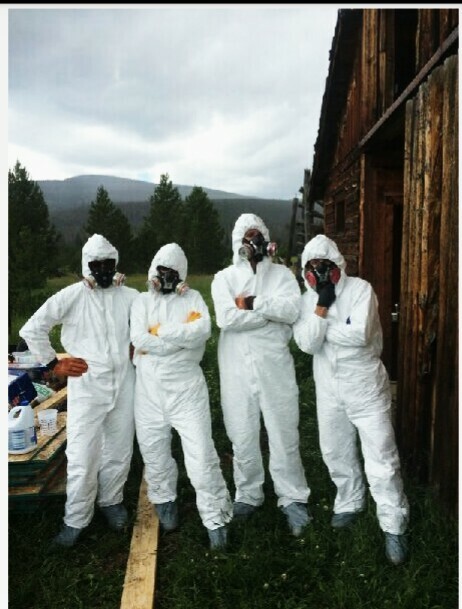 We had some assistance from our supervisors, but it was primarily putting their advice and teachings into our own work. The satisfaction that we were there to experience every bit of the progress and finally its completion was unbelievably rewarding. With no construction or carpentry experience, we were able to complete a project our supervisors didn’t even think we could finish. It was sad too, knowing that our work there was done. I loved working at the barn, it was unbelievably picturesque with the old barn itself, the Never Summer range as a backdrop, the abundant moose, the colorful wildflowers, the Little Colorado River weaving just beside us…it was the most breathtaking office I can imagine. My favorite memory of the summer was probably one of our trips to Winter Park for free music. Most of our crew was able to go, and we listened to the Boogie Boys, a Polish cover band that put on one of the best free concerts I’ve ever been to. I got Dhante and Joe to go up to the stage with me and we had a blast dancing and singing with the band, surrounded by lots of retirees having the time of their lives. It was so much fun, and I thought we bonded quite a bit over the experience. 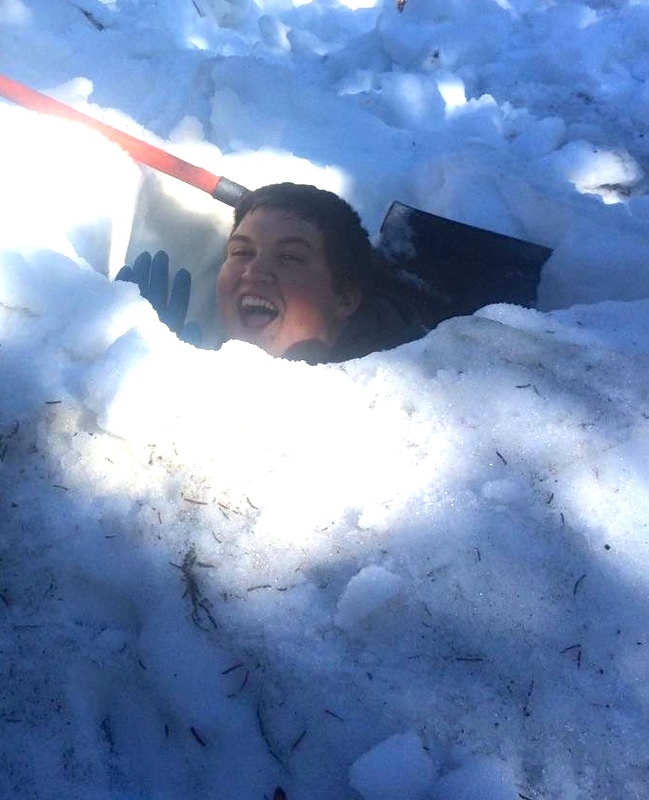 The first day at Lake Irene we had to scoop snow from the back of the building and I went to a tall part in the snow and dug straight down. I kept digging and digging and digging. Finally, I hit the bottom and found some dirt. So I jumped down in the whole. Needless to say the whole was deeper than I expected. I am about 6’ 3” and about 6’ 4” tall in the boots i was wearing and my head was barely sticking out. My favorite work location was Lake Irene. I loved Lake Irene because it was a beautiful aegean and had nice cool air so it wasn’t too hot. I also liked it because there were tons of tourists and they all wanted to talk. I am not a very shy person so it was always fun for me to tell people what we were doing. Also, I liked using power tools and putting up the cedar shingles….one by one. My favorite memory was working with the past program. Rich (man on the right) was from Cape Cod and he was a very funny man and was hard working. Rich was also very patient and showed us his way of doing stuff. Also, he taught us the “Cape Cod Cut.” It turned out to be just a normal cut but we went along with it. 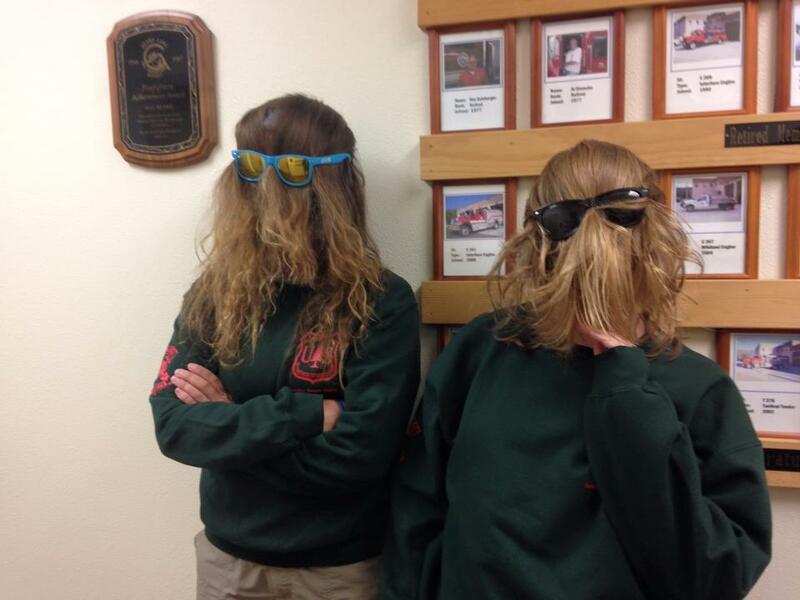 When we worked with the past program, there were many laughs and fun times. 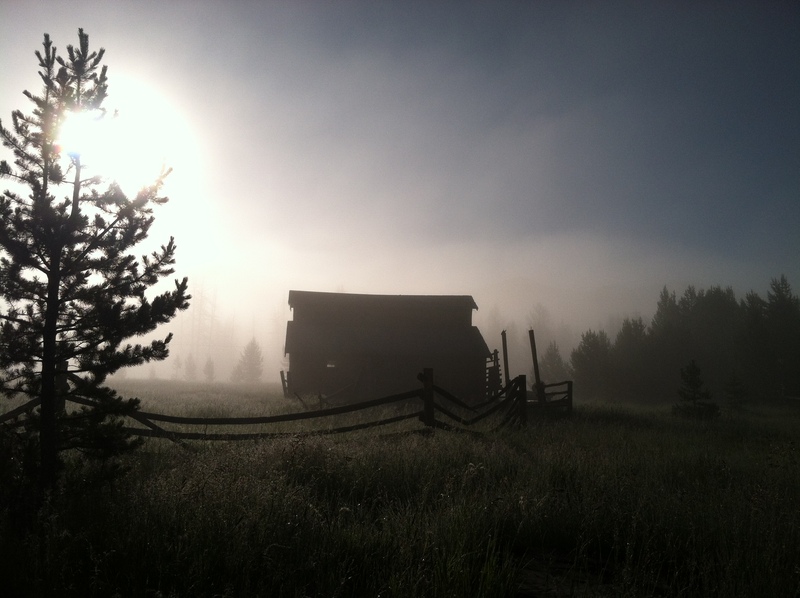 We encircled our worksite through a meadow of dew frosted grasses, an elusive rainbow arched over our dirt path allowing us to peer at the historic Little Buckaroo Barn it its natural state, so primitive, so isolate, and so hauntingly beautiful. 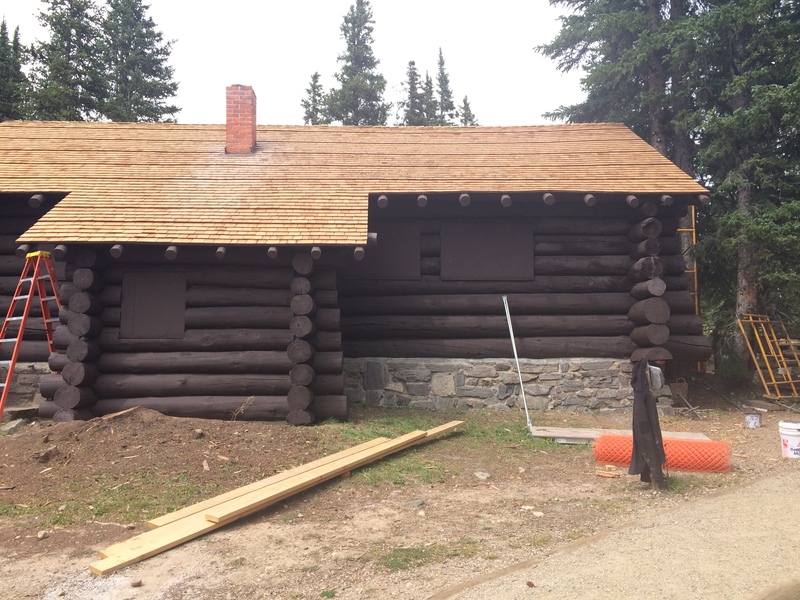 Favorite Project: As part of the Kawuneeche Crew I had the opportunity to aide in the restoration of two historic buildings throughout the summer season, a 1926 CCC Mess Hall and the Little Buckaroo Barn built in 1942. The barn was definitely my favorite of the two due to the fact that it resides in proposed wilderness land and therefore must be treated as wilderness, meaning no mechanized tools were allowed to be used during restoration. This detail added a fair amount of struggle (and usage of a few choice words) in causing the crew to hand carry all materials in each day and rely on pure carpentry skills to restore the building to a preserved state. 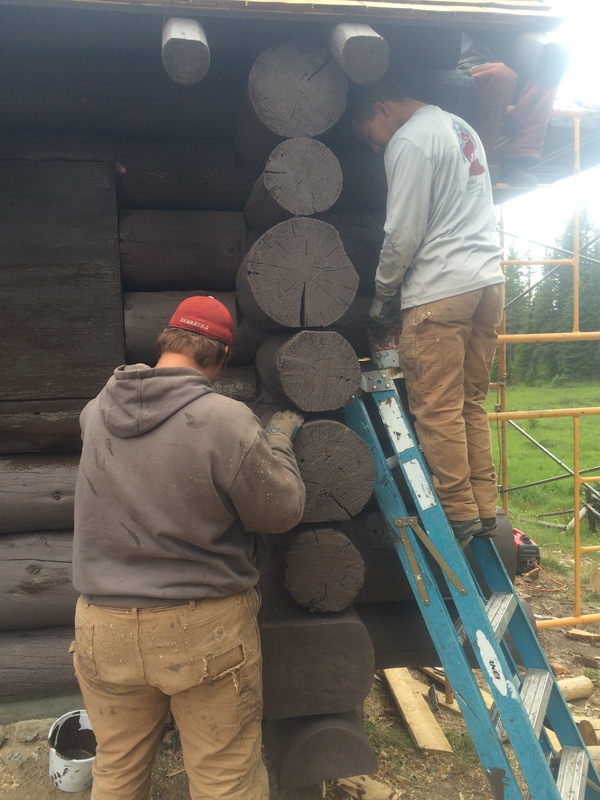 Our jobs were to replace the three-tab asphalt roof, many rotten wood siding panels, almost all of the rafter tails that hung out past the roof edge which had been degraded by the elements, and improve overall stability of the barn. By far my favorite lunch spot the barn sits in a meadow of wildflowers where animal life crosses at all hours of the day. Both a challenge and a masterpiece the barn was completed way ahead of schedule. 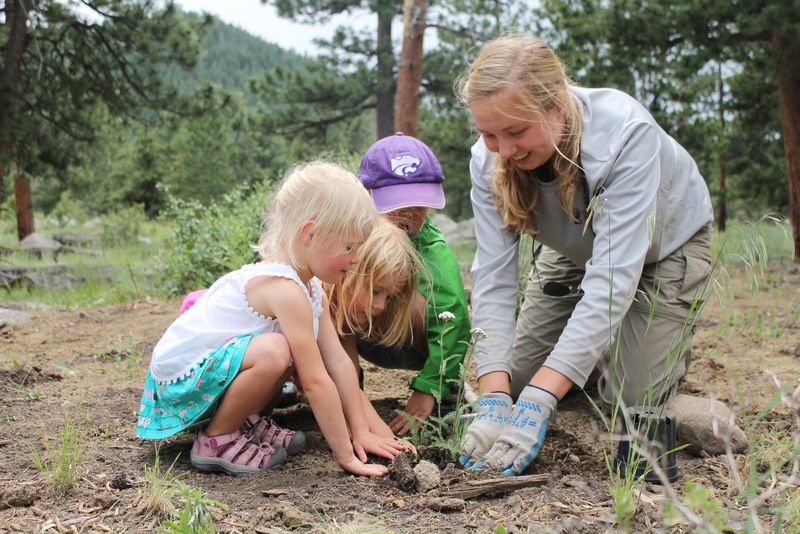 Favorite Memory: My summer working with the Rocky Mountain Conservancy is full of many memories. My favorite experience with the Kawuneeche Crew was a yoga lesson taught by Jenna Mulligan, a fellow crew member, where in which we all stretched our bodies in strange new ways. Jenna adjusted our form and we laughed as we all attempted to hold our balance, many of us slipping on the carpeted floor. After moaning and groaning we all lay in savasana, our final resting state feeling joined as a group in euphoric content. My favorite photo is from a backpacking trip up to Parika Lake on the last weekend in the west side of the park. We camped down in Bowen gulch and had a front row seat for a beautiful blue moon. 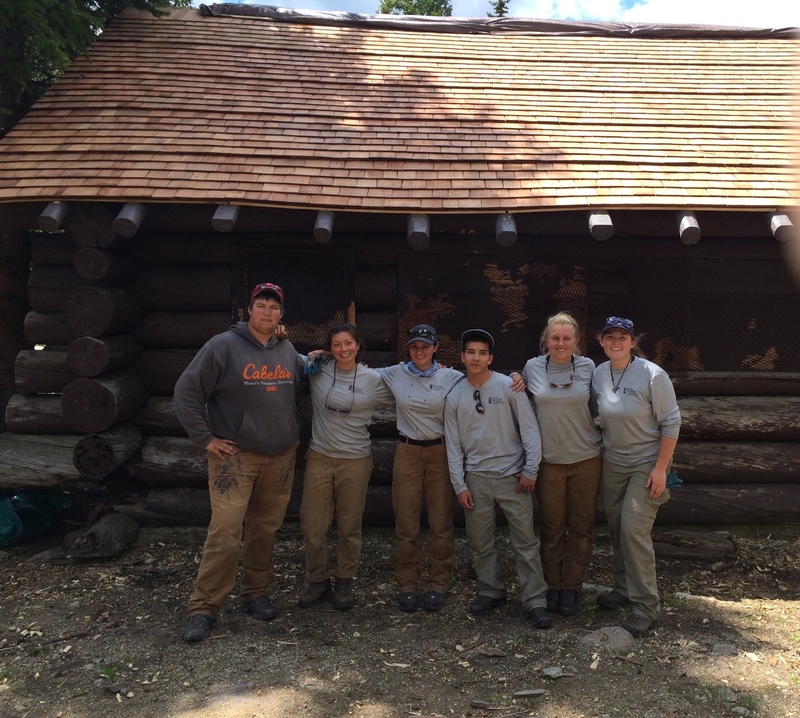 My favorite work project was the cedar shake shingling and log replacement at the Lake Irene mess hall. This work was really detailed, and our speed and quality of work improved as we got higher and higher on the roof. During the shingle removal, we could see through to the inside of the cabin and the curtains and dressers that were left behind. By the end of the project, the building looked polished and the improvements were really evident. 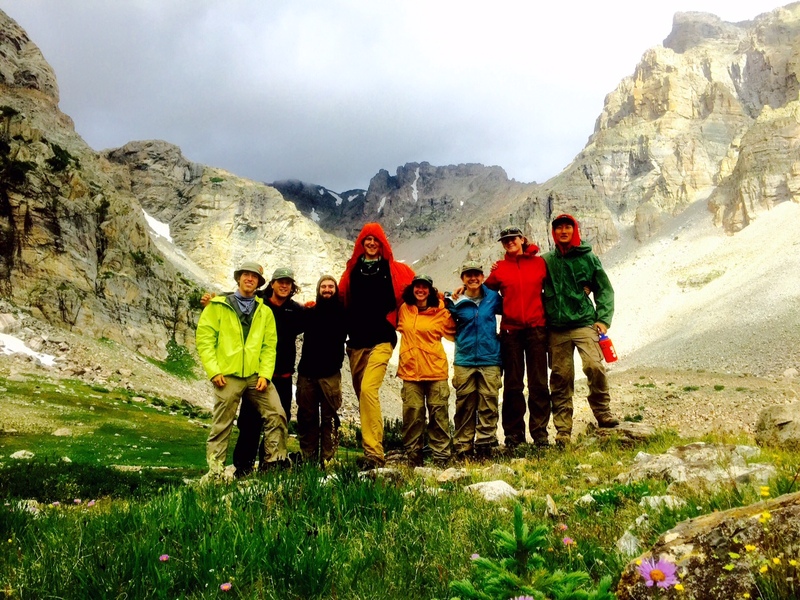 My favorite memory from the year was the hike that the entire crew took up to the continental divide past Millner Pass. All six of us made it up to the tundra, and it was a blast to spend some time all together on the trail. 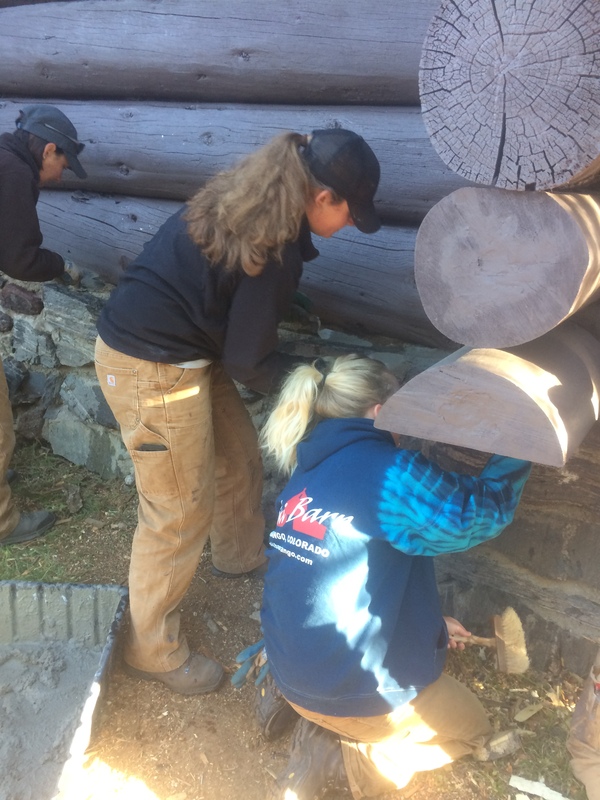 Favorite project: Working on the “Little Buckaroo Barn” because this property was in proposed wilderness, which for the crew meant no power tools or vehicles allowed. This was a challenge for us because we had been used to mechanical means in our other projects. 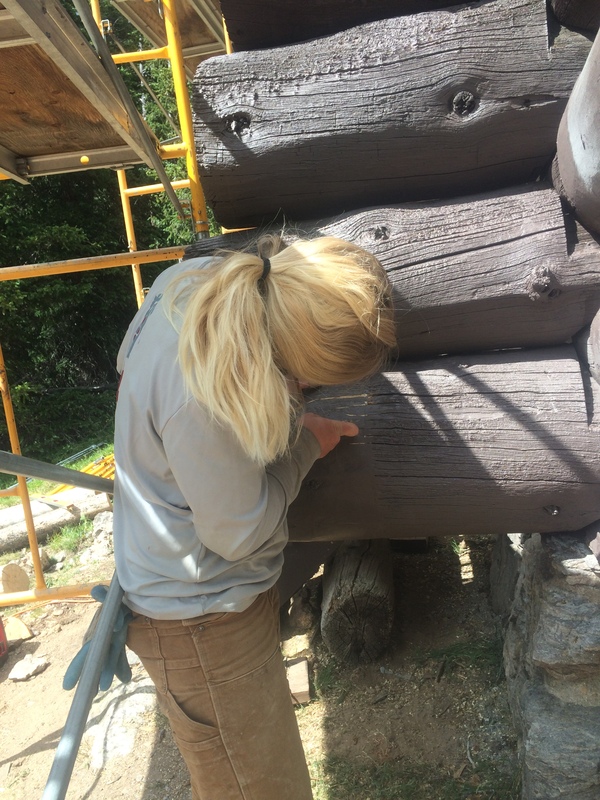 The best thing was being able to appreciate how things were done in a time not that long ago, by using a hand drill and hand sawing everything was really cool! Favorite memory: Climbing Longs Peak with the Conservancy. Being at the top, I felt nothing but freedom and accomplishment. Also, Being at the end of the picnic and talking to all of our members who were just so happy to find out how our summer was and learn about all of our projects. They really loved the posters that all the crews had made showcasing their experiences, which really made the day that much better for me seeing how much they appreciate our work. 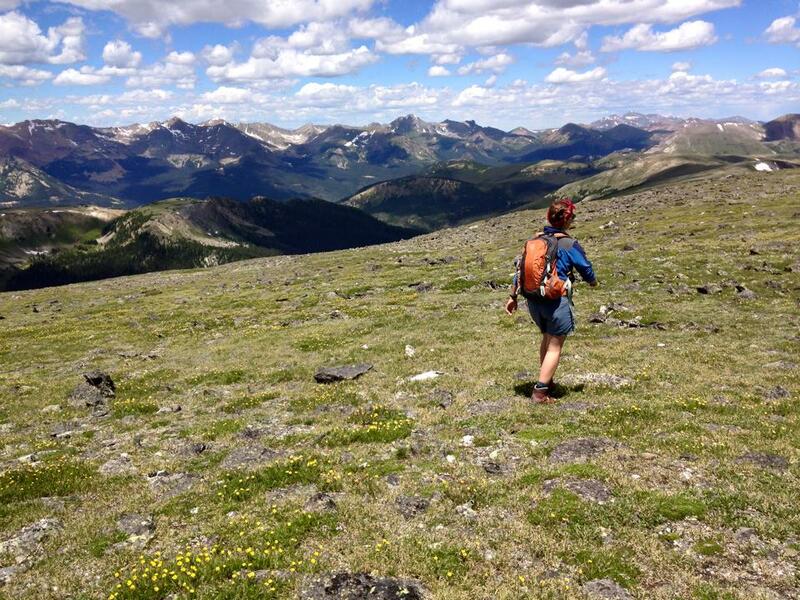 This photo is from the Comanche Peak wilderness week. And is from the third day on the hitch where when we were on the Browns Lake trail. 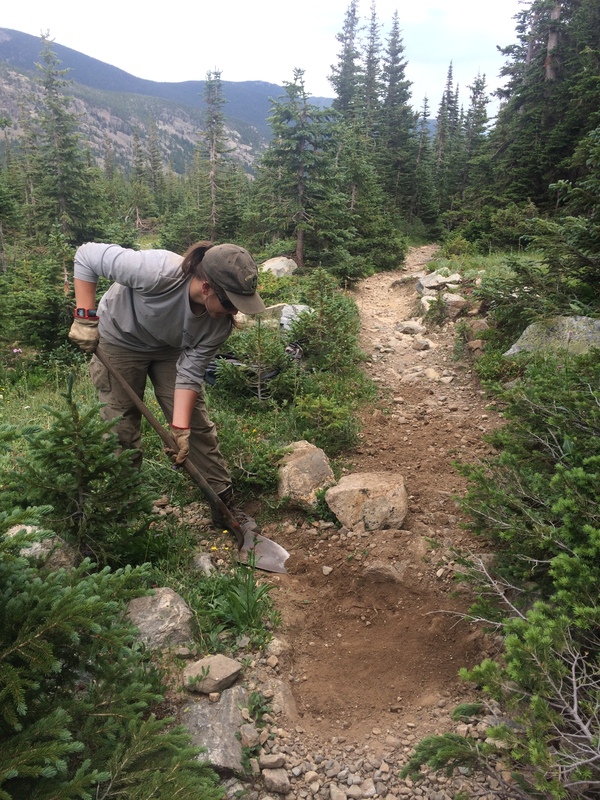 My favorite project this summer was the working on the Killpecker Trail. This was my favorite trail this summer because of the peak we were able to get on top of. We were able to look out over the whole Red Feather area and we got to the top of one of the tallest peaks in the area. It was nice to have a trail that went to a view rather than end at a random spot or at a road. This was also the most difficult trail in the area by far and it was nice to have a challenging day on trail. My Favorite memory from the summer would have to be from the first week. We went to Rattlesnake Canyon outside Fruita and Grand Junction and attempted to go on a backpacking trip. This ideas was thwarted however by the fact there was no water, so even though we ran out of water we made it to the arches and eventually hiked out and a seven mile day turned into a 14 mile day with some of the best views I have ever seen. Favorite memory: My favorite part of my experience this summer was getting to know my crew over the few months that we spent working and living together. I especially enjoyed our time together after work watching movies, having fires, making food for my crew and walking down to West Lake to fish and watch the sun set. 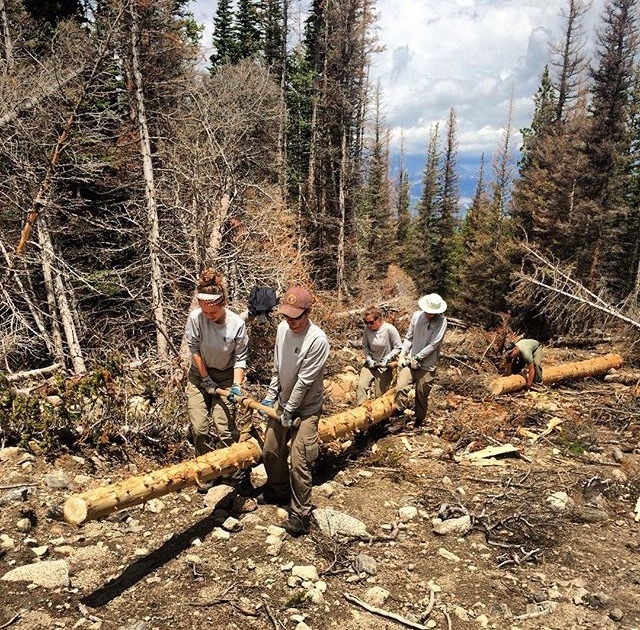 Favorite work Project: One of my favorite projects this summer was when we went back to North Lone Pine to clear the nine down trees that we left. We finally got to put our cross cutting skills to use. I enjoy using the cross cut because it takes team work and it is a task that takes thinking through and strategy. 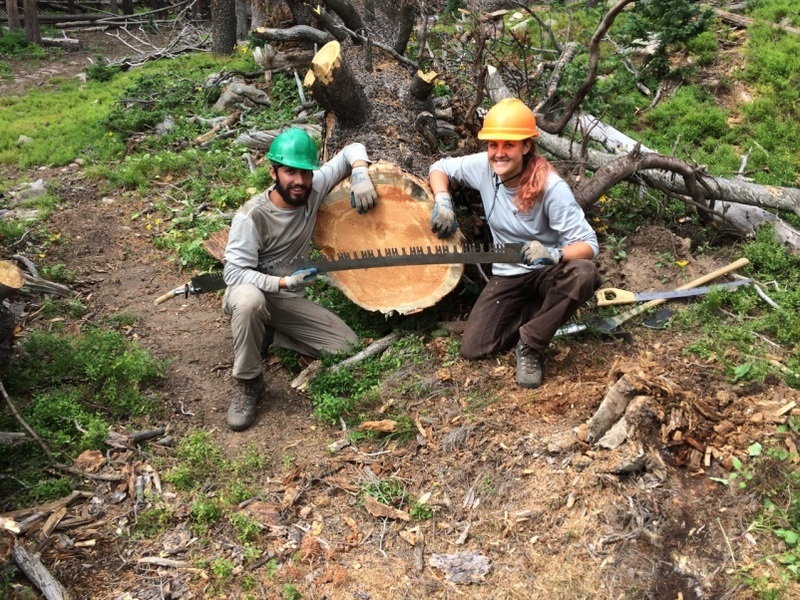 Favorite picture: Picture of me and Maggie after we finished cross cutting the huge tree at the end of the lone pine trail. Favorite moment: Second trip to lady moon when we were walking through the huge field. The wind was blowing the grass and the surrounding landscape was incredible. Made me realize how happy I was to be there. Favorite work location: Swamp creek trail. Finally felt like we were getting out there and got to enjoy the trail in the middle of nowhere. The solitude was a nice change and the scenery was awesome. 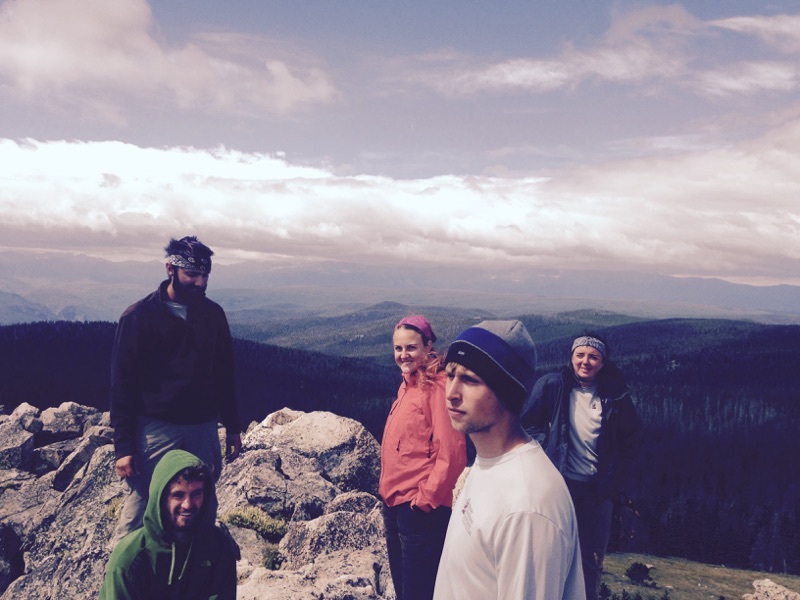 Favorite memory: One weekend I went backpacking with a few members of the Estes crew. 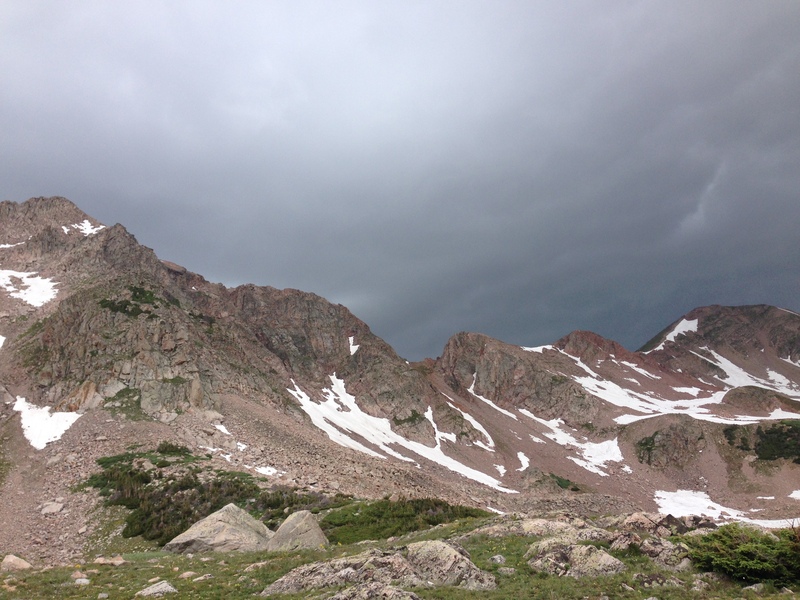 We trekked 6 miles and over 3,000 vertical feet up to the Boulderfield on Long’s peak. Exhausted when we arrived, one of our tent poles snapped while we were setting up at 9:00 pm. Our tent was in rough shape and would have collapsed had the wearer been anything but perfect. Luckily the night remained clear despite predicted storms at 11:00 pm. 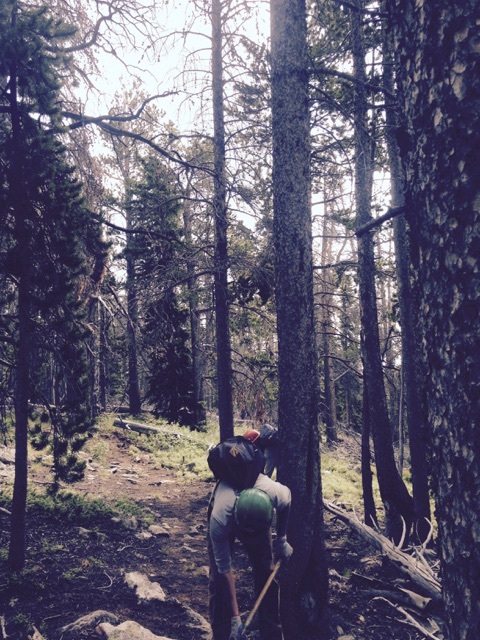 In the morning we picked our way through the boulders to summit Storm Peak and then Mt. Lady Washington to get some unique views of the park. Afterwards we went down the other side of Mt. Lady Washington to Chasm Lake. The down climb was the most sketchy and exciting thing I’ve ever done. Rocks and skree were shifting beneath my feet, threatening to send me into the lake below. You had to constantly think about your next move and the two hour ordeal was overwhelmingly mentally taxing. Looking back up the slope we came down made my head spin with awe and a fresh, profound respect for the Mountain. 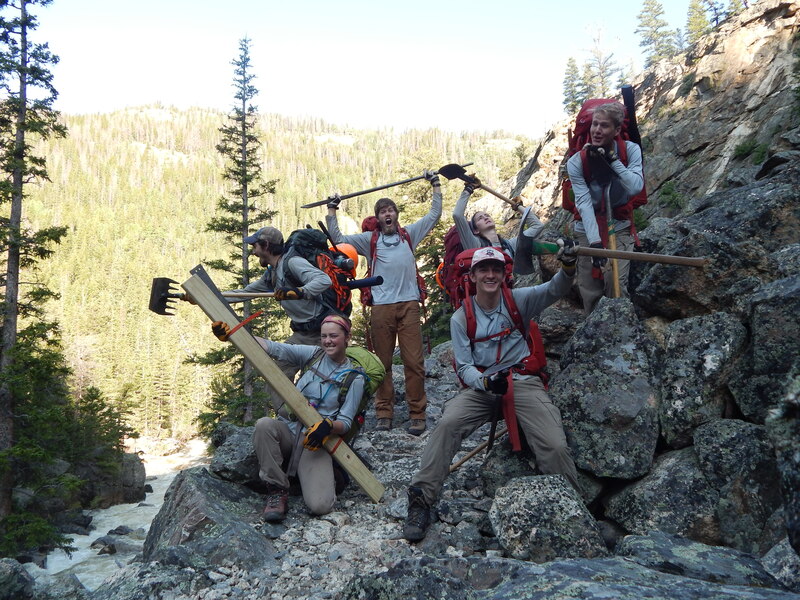 Favorite work experience: Working backcountry in the Comanche Peak Wilderness with the Rawah Crew was without a doubt my favorite work experience. I had never been backcountry before and up until that point, I had a mild fear of it. 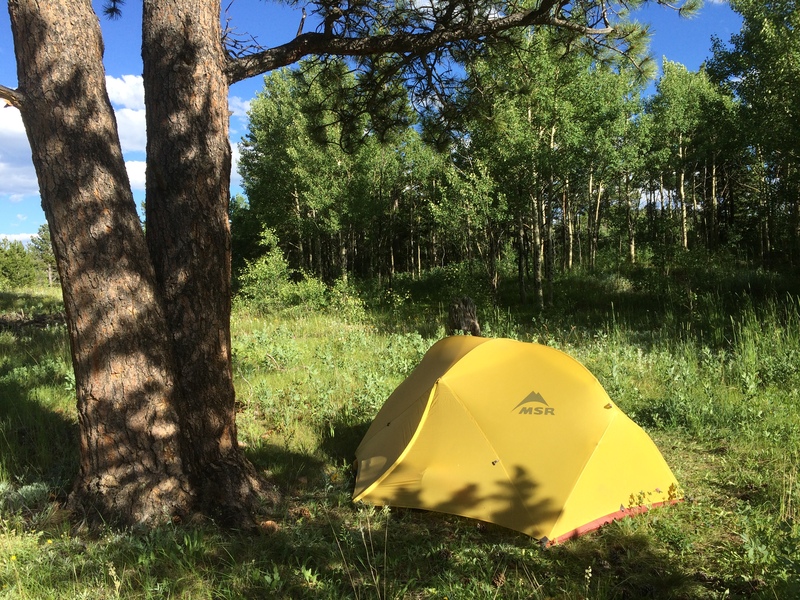 But camping next to the reservoir on forest service land, pumping water every morning and working/exploring the alpine trails in the area quickly whipped away all my fear. The trails themselves were incredible, with views of the Rawah Wilderness as well as several of the mountains in Red Feather where we had been working all summer. One day after work a few of us summited a rolling peak above tree line to get a 360 panoramic of the Mummy Range, Rocky (we even saw trail ridge road on one of the mountains! ), the Never Summer range, the Rawah Wilderness, the Poudre Canyon, Red Feather, and way off in the distance, a mountain range in Wyoming. Before working there I had no idea that such a compete view of northern Colorado’s mountains existed, and the memories I made camping and working on the trail with our two crews will stick with me for a lifetime. 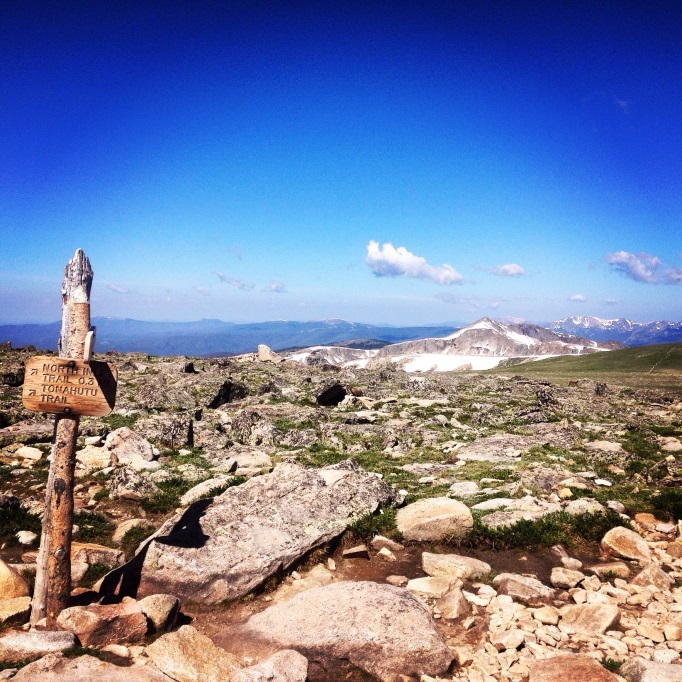 Favorite memory: On the Fourth of July weekend this year I hiked up and over the continental divide, from Estes Park to Grand Lake, for a backpacking trip. This hike was 18 miles and required I bring at least 40 pounds of gear with me. A mixing of the RMC’s Estes crew and Red Feather Lakes crew made the journey. The trip consisted of several obstacles to overcome. The first being that, on the morning before the journey I had discovered my backpack had a torn shoulder strap. Being the resourceful type (sort of) I grabbed my 11th backpacking essential (duct tape) and made some emergency repairs. These repairs were quick and not the most well oriented, but they more or less worked. The only issue with them was that it left my bag hopelessly unbalanced, meaning I had to put in much more effort on balancing my pack on my shoulders than hiking. This did slow me down, but I persevered and pushed through. My second challenge for the day was the honey (for my sandwiches) spilling on the inside of my bag. This left most of my gear a sticky mess. While this wasn’t much of an obstacle for hiking it certainly didn’t help morale. This leaves the final obstacle for hike, a very large bull elk right in the middle of the trail. The elk remained on trail for a solid 45 minutes. He was a rather inspiring sight; however his presence put the trail on hold and put our crew behind schedule (a problem when your schedule includes hiking for 9 hours, just hoping for the chance to have a feast in Grand Lake). 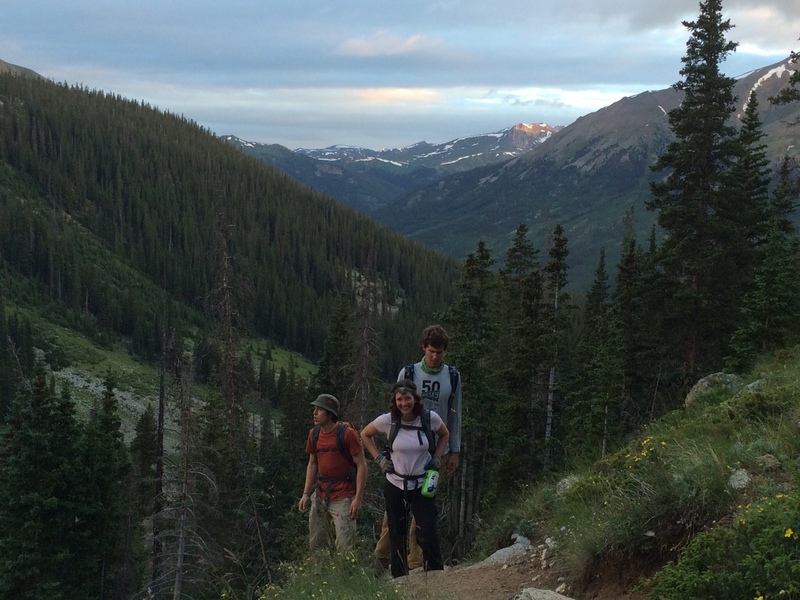 Favorite work experience: The Comanche Peak Wilderness was, without a doubt, the best experience of the summer. That week will forever remain as a vivid memory etched into the back of my skull. 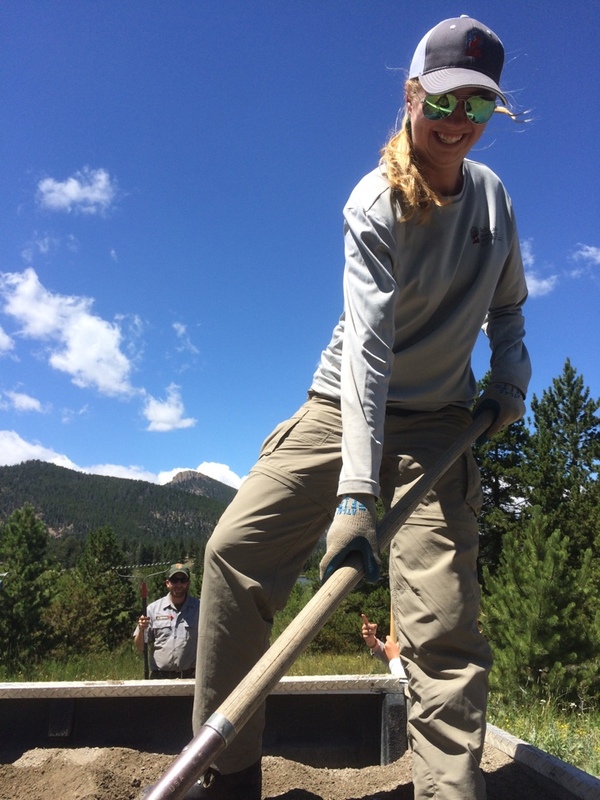 Working for the Rocky Mountain Conservancy resulted in a lot of scenic views and that is what made the job worth all of the sweat and hard labor. 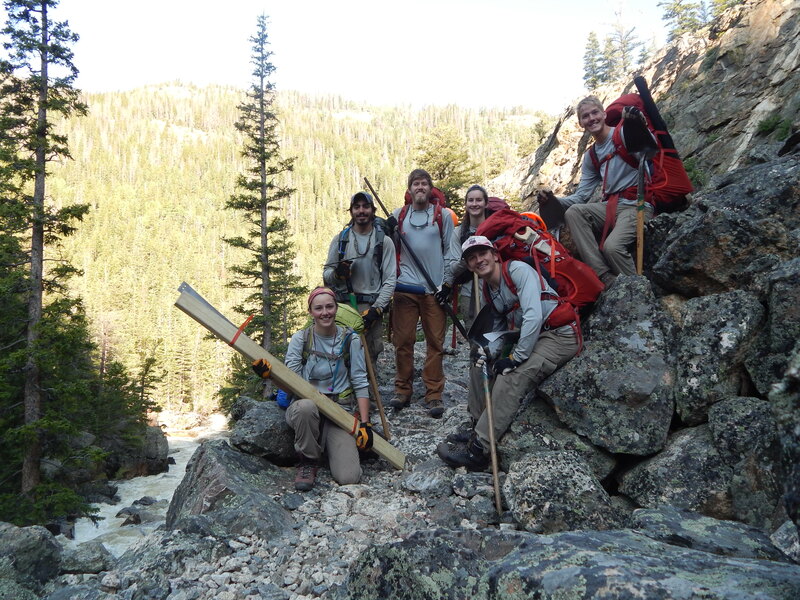 The second to last week of the internship the Rawah and Red Feather Lakes crews collaborated on a back country hitch in the Comanche Peak Wilderness and I was lucky enough to join this expedition. All around me was lush forest, majestic views, and fresh air. Out of all of these views, one stands above the rest. 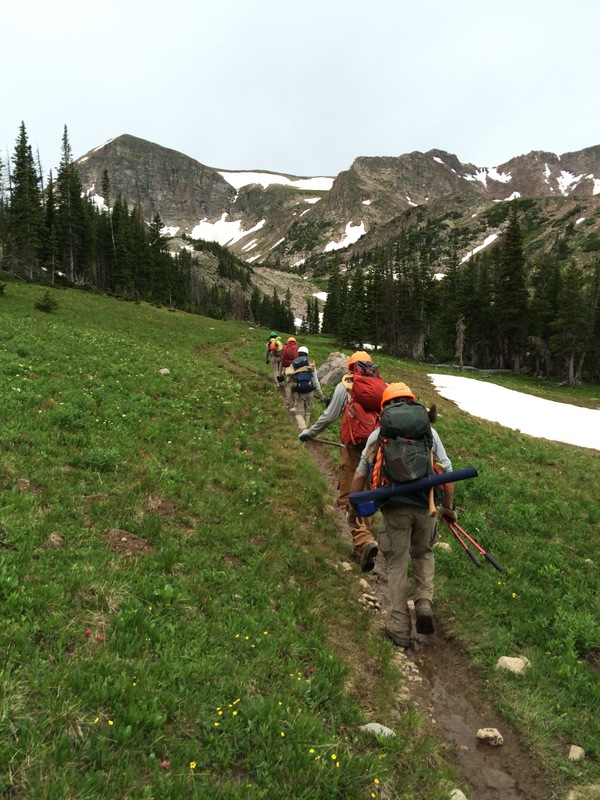 On the Wednesday of that week the crews went to work the Browns lake trail. 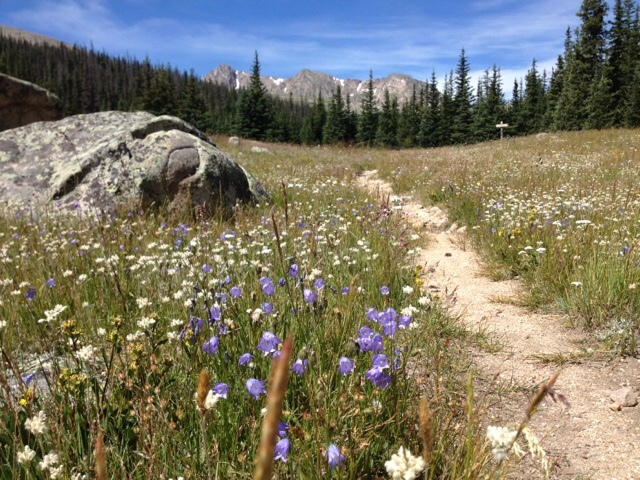 The trail took a steady ascent past Browns Lake into the alpine tundra. By following this trail, the tundra pointed to a peak that stood above a wide open valley. 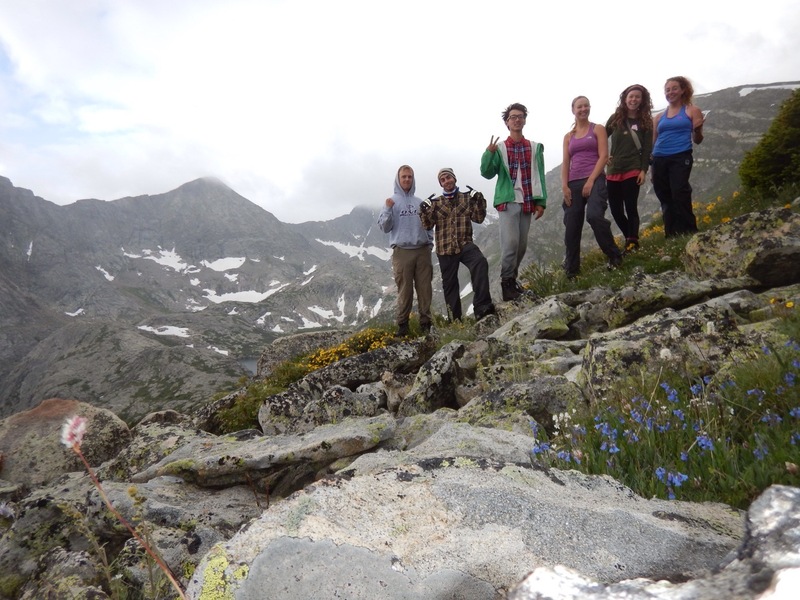 Without hesitation we continued working the trail, knowing we would be rewarded heavily at the summit. Once on top we were gifted with a view like no other. 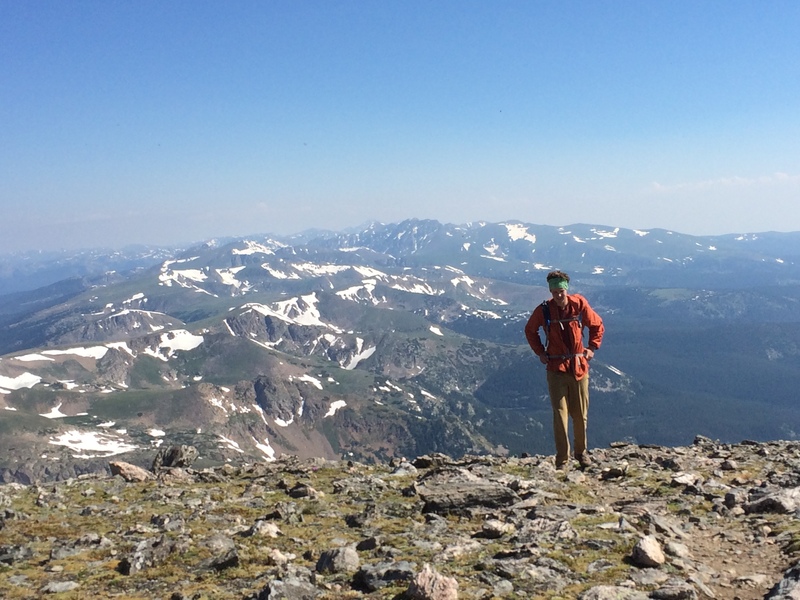 The summit allowed us a three hundred sixty degree view, where we could see the Rawah Mountains, the Bald Peaks, the Mummy Mountain Range, and Rocky Mountain National Park. It was like standing above giants and existing on a plain of existence that is incomparable to others. As far as the eye could see, there were picturesque mountains that were so awe inspiring that everything else seemed to fade away. The pain in my legs was but a distant memory. The cold wind against my face felt distant and unimportant. Every one fell quiet and just enjoyed ourselves. This was the kind of view that leaves the mind blank, except for an extreme sense of joy and an overwhelming feeling of just how lucky one person can be. This view was by far my favorite experience while working. 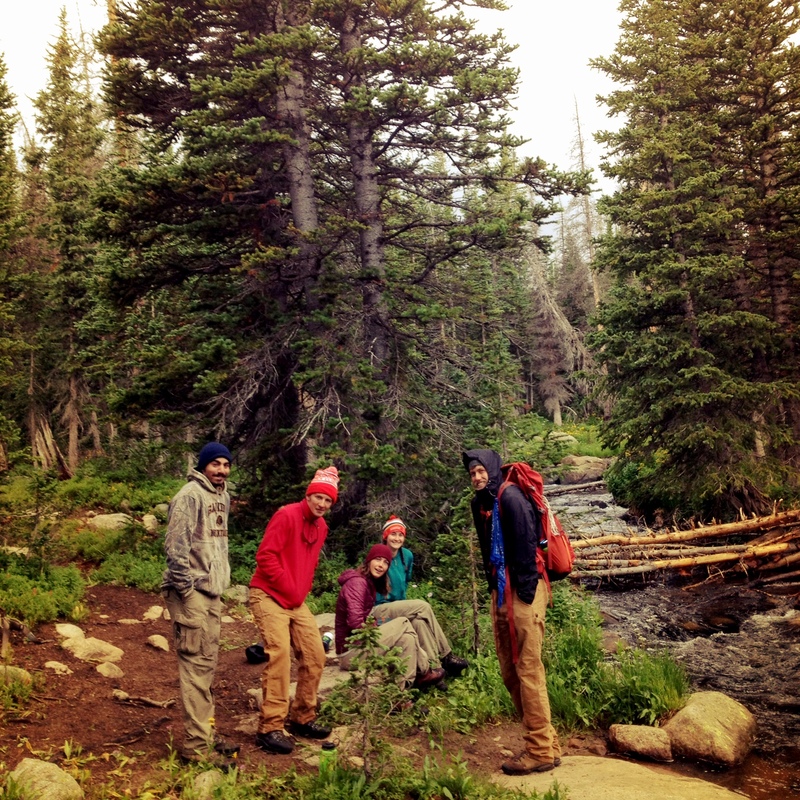 My favorite memory from the summer is going out on a backcountry hitch wth the Rawah crew. We spent a lot of time with them throughout the summer because they were so close to us and we also did our training with them. We became so close in fact that we created the name “Redwah” as if our crews were one. During that hitch we were able to cover a lot of miles of trail and drain a lot of muddy sections of trail, all while keeping our sense of humor and having a great time. My favorite project from this summer was the turnpike we built on the Mt. Margaret trail in Red Feather. It was one of the first projects that we had done, but despite our inexperience we fixed a heavily damaged section of trail. About a month and a half after completing the turnpike I went on a bike ride down the trail after work and was pleased to see it had settled and was holding up to a lot of abuse from stock and cattle.